Murphy won a second term after amassing a fundraising war chest that was 100 times larger than his opponent’s. Left: U.S. 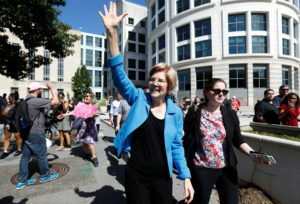 Senator Elizabeth Warren waves as activists gather for a protest march and rally in opposition to U.S. Supreme Court nominee Brett Kavanaugh outside U.S. District Court in Washington. Warren on Monday released DNA evidence supporting her claim that she has Native American ancestry. Photo by Kevin Lamarque/Reuters.